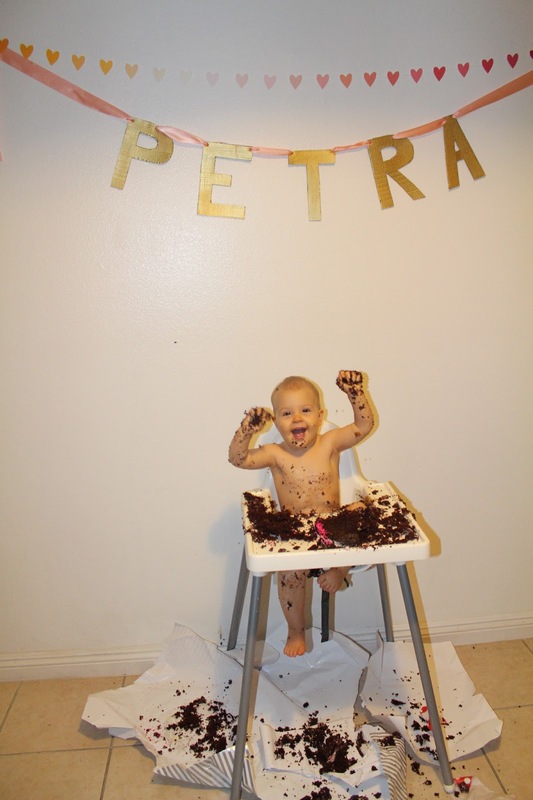 Petra turned one last week and we had a perfect, small celebration with family. 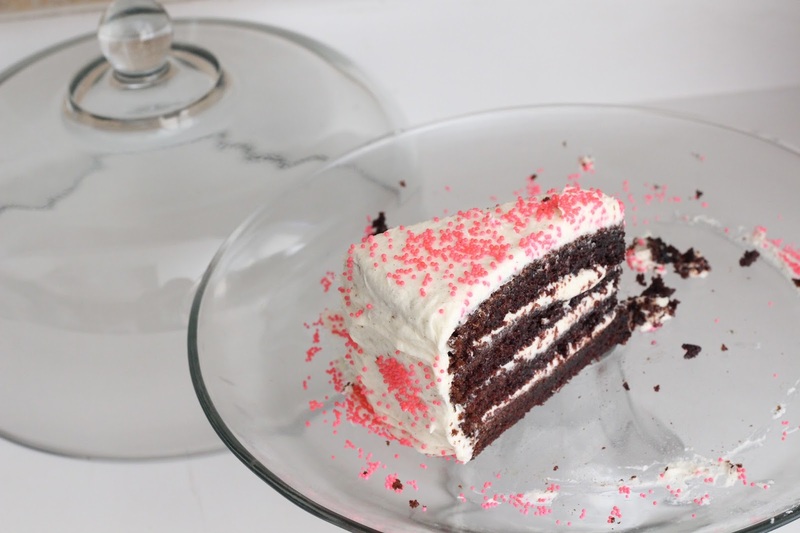 I was beyond excited to make her birthday special, including baking this seriously delicious chocolate cake with vanilla bean buttercream frosting (and hot pink sprinkles!). I think I will be making this cake for every celebration I host from now on. It is moist, rich, and SUPER easy to make. We devoured it so quickly that the only picture I snapped was from the next day when there was only one slice left. Preheat oven to 350 degrees and spray cake pan(s) with non-stick cooking spray. Beat together all ingredients until smooth batter forms, reserving the chocolate chips if using. Pour batter into cake pan(s) and bake according to the time directions given on the cake mix box (30 minutes for a traditional round cake). 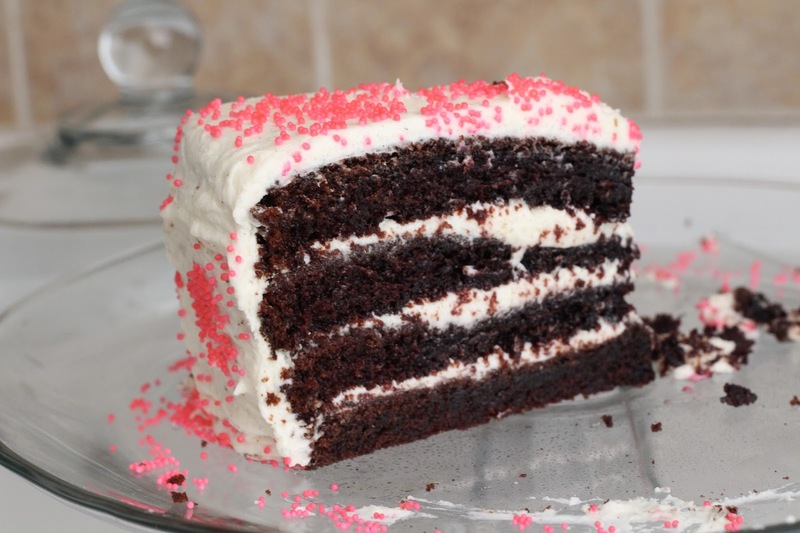 Let cool completely before slicing each layer in half and frosting with Vanilla Bean Buttercream frosting. *I'd also like to try this with this Best Ever Chocolate Frosting recipe sometime. In a stand mixer or large bowl, whisk together the butter and shortening, scraping down the sides as needed, until smooth and blended. Add 1 cup powdered sugar and 1 tablespoon milk, then whisk until smooth. Add 1 cup powdered sugar and 1 tablespoon vanilla, then whisk until smooth. Be sure to scrape down the sides as needed when mixing. Enjoy! 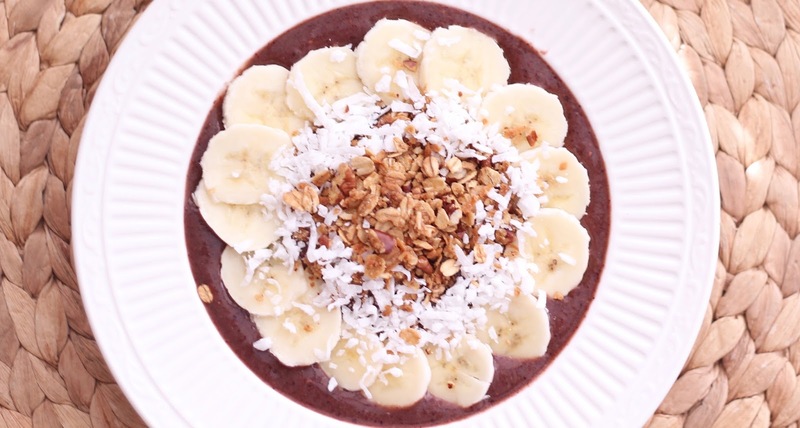 Place all ingredients, in order, in a high-powered blender, such as a Blendtec or Vitamix. Blend until smooth, using the pulse button and a spatula to work through any rough patches. If necessary, add a little more juice to blend until smooth. 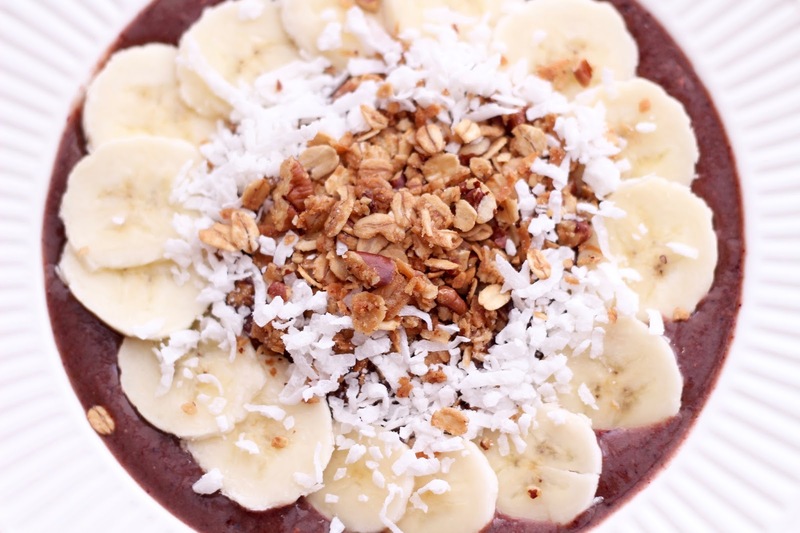 The goal is to make the smoothie as thick as possible. 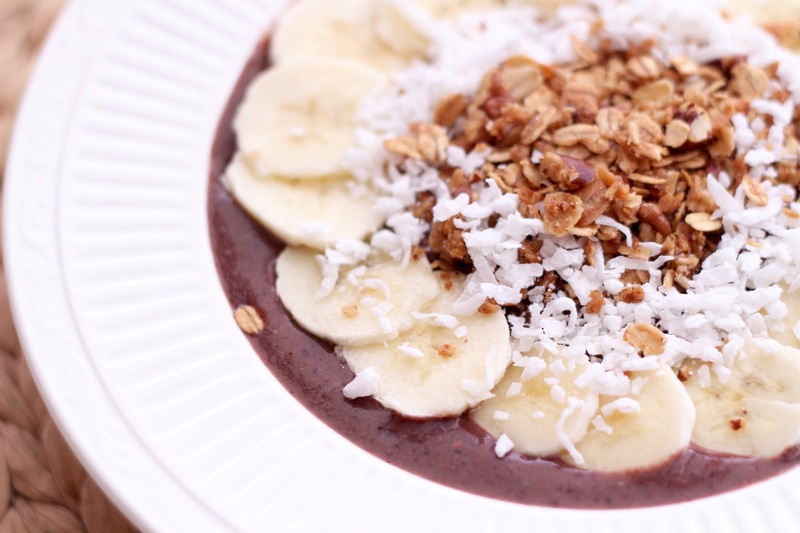 Once blended, pour smoothie into a bowl, then top with bananas, granola, and coconut flakes. On May 7, 2014, I quit my job as a brand manager at a very large advertising firm. Two days later, my husband and I were on a plane bound for Bangkok with no return ticket. We spent seven months traveling around eight different countries in South and Southeast Asia before returning to America to start a family and pursue some entrepreneurial opportunities. The experiences we had while traveling added value, richness, and strength to our lives. We have seen the far-reaching beauty of this earth, marveled at man's greatest achievements, endured long, hot, sticky, crowded train rides, witnessed pure devotion and humility, watched heartbreaking and inspiring acts of service and love, grown to understand each other on an entirely deeper level, and grown to understand the vast expanses and far-reaching differences of the human experience. The biggest factor holding people back from gifting themselves the experience of prolonged world travel is fear of life after you return. The question of life after you return is both the beauty and the angst of travel. To make this question more beautiful and less anxiety-ridden, it's best to set yourself up for as many options as possible after you return. If you work hard at your job now, maintain positive relationships with co-workers, and develop a strong professional reputation, then doors will open for you upon your return and you'll feel more peace and calm about creating a gap in your resume. If you slack off and keep an attitude of "I'm out of here in a year, why give a hoot? ", then you'll experience a lot more anxiety before, during, and after your travels. Decide how much you need to save and give yourself a reasonable timeframe to save that amount. Then, do it. The amount you decide to save will be depend on how long you want to travel, where you want to travel, and how much you want to have in your bank account when you return. I will tell you that it's possible for two people to travel through South and Southeast Asia for 7 months on $10,000 (we did it). 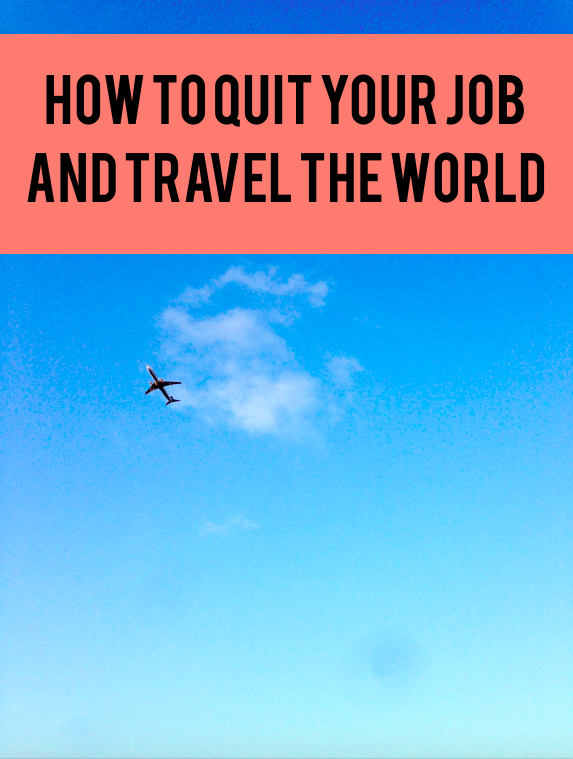 Here is a great resource that gives the real costs of 11 different trips around the world to help you get a sense of travel costs. Once you decide how much to save, then SAVE IT! Cook at home instead of eating out, read books (from the library) and invite friends over to your place instead of going out, spend time working hard at your job (step 1), and watch the number in your bank account go up. Once you've saved enough, save a little more, then move on to step 3. This is the most important piece of advice in the whole process so pay attention. Buy the ticket before you tell anyone about your plans. And make sure your ticket is non-refundable. "What will you do when you get back?". You won't have all the answers to these questions and that's okay (if you've already bought the ticket). People may make you doubt yourself and your decision. And that's okay (if you've bought the ticket). Because once you've bought the ticket, your adventure has already begun.